Established: By Legislative Decree No. 166 of 4 July 1953. Syria''s highest purely military decoration, this is awarded for bravery and leadership on the battlefield. In normal cases, recipients begin at the lowest class and are successively promoted to higher grades within the award. In exceptional cases, the award may be presented to foreign nationals and the highest class has been frequantly awarded to foreign chiefs of staff. 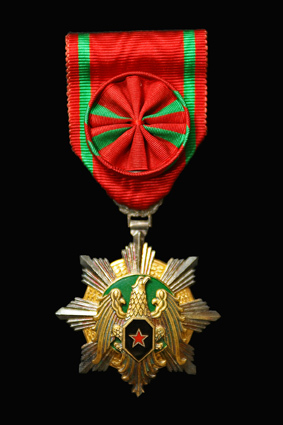 This award has also been referred to as the "Military Honor Medal" or the "Order of the Legion of Honor". Obverse: An eight-pointed star, white enameled and backed in gold between the points. 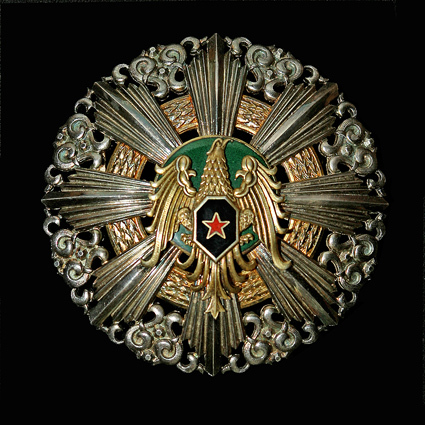 In the center, the gold Syrian eagle with a black shield on its chest with a five-pointed red-enameled star. Suspended by a ring. Ribbon: Light red moir with a 5 mm medium-green stripe 4 mm in from each edge.